Teachers College Press, 9780807749555, 222pp. How do we recognize the wounds caused by outdated schooling policies? How do we heal them? In her controversial new book, education writer and critic Kirsten Olson brings to light the devastating consequences of an educational approach that values conformity over creativity, flattens students' interests, and dampens down differences among learners. Drawing on deeply emotional stories, Olson shows that current institutional structures do not produce the kinds of minds and thinking that society really needs. Instead, the system tends to shame, disable, and bore many learners. Most importantly, she presents the experiences of wounded learners who have healed and shows what teachers, parents, and students can do right now to help themselves stay healthy. 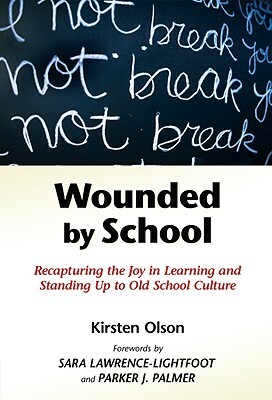 Kirsten Olson is a writer, educational consultant, national level Courage To Teach facilitator, and principal of Old Sow Educational Consulting. She has been a consultant to the Bill and Melinda Gates Foundation, the Kennedy School at Harvard University, and many large public school systems and charter schools.